If you think today's stars go to great lengths for beauty, it's nothing in comparison to what the screen sirens of yore did for vanity's sake. 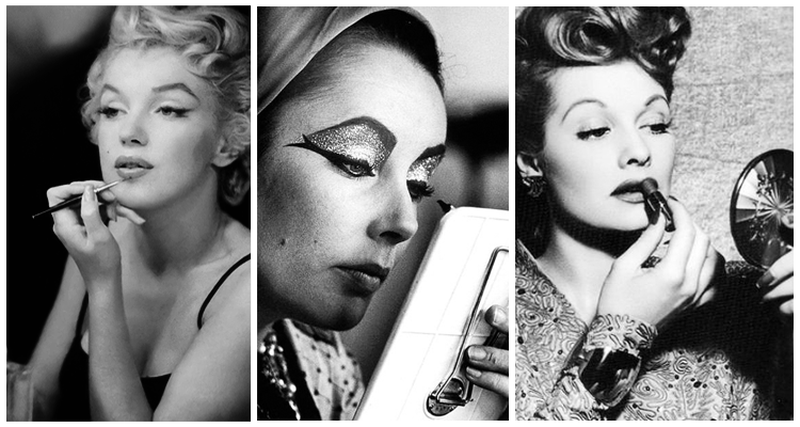 From DIY techniques that belong in your routine to don't try this at home, here are the super-sneaky beauty secrets of Hollywood's golden age. To make her lips appear fuller, Monroe would have her makeup artist apply 5 different shades of lipstick and gloss to create dimension. Darker reds went on the outer corners, while lighter hues were brushed on the middle of the lips. Liz Taylor took a page out of Cleopatra's book, as both women made a habit of shaving their face. It may sound funny, but it removes the fine baby hairs and the surface layer of skin cells, which gives the skin a facial-like glow. The secret to Hepburn's long, Bambi lashes? After applying mascara, she'd use a pin to separate each individual lash. Now that's how you get clump-free lashes. During her career, Lombard was injured in a car accident that left her nose slightly curved. Before she put on her makeup, she'd draw a thin white line on it as she believed it made it look straighter. Contrary to popular belief, contouring is not a new technique, nor was it invented by Kim Kardashian. The Princess of Monaco used blush to define her cheekbones, with one shade for underneath her cheekbones, and a slightly darker shade dusted on the apples. Full lips have always been a coveted beauty trait, and Leigh was insecure about her thin bottom lip. To compensate, she used liner to to draw outside her natural lip, giving the illusion of a larger pout. The German-American had plenty of tricks up her sleeve, but she was most notorious for having her molars removed to further accentuate her cheekbones and using surgical tape to give herself a temporary face lift. Whoa. Hayworth's wavy red mane was her signature–so naturally, she had to keep it in tip-top shape. She did this by applying oil to her hair after every wash, wrapping it in a towel, and leaving it in for 15 minutes. Afterwards, she'd wash it out with hot water and lemon juice to remove any leftover residue. To make her eyes look more theatrical, Garbo put a thin layer of petroleum jelly on her eyelids underneath a dark eye shadow. She also lined her eyes with a mixture of jelly and charcoal pigment. Coconut oil may be all the rage today, but the '30s star used it daily throughout her life. She would apply it to her face as moisturizer to give her skin a youthful glow. Health food was kind of Swanson's thing and her skin reaped the benefits. "My best beauty secret is raw vegtables," Swanson told Weekly World News. "I apply them on my face and make sure I eat them regularly. As far as I'm concerned, there is no beauty product better than raw vegetables." Bergman notoriously took an au naturale approach to beauty, only wearing a significant amount of makeup if required for a role, but she did shave a centimeter off of her hairline (not an unpopular grooming technique of the time) for a larger forehead. Loren followed a Mediterranean diet religiously, which meant she always had a bottle of olive oil at arm's length. She kept her skin soft and luminous by soaking in a hot bath with a few splashes of oil. Over the course of her career, Grahame was self-conscious of her upper lip, which she felt was too thin. She would stuff cotton or wads of tissue between her lip and teeth for a plumper look. As if kissing scenes weren't awkward enough..
To this day, we wax poetic about Bette Davis eyes. She kept them looking bright by applying cucumbers to her lids at night and and using petroleum jelly under the eyes to combat dark circles.